We are delighted to be able to report that an order for copper for the inner firebox and firebox tube-plate was placed with the SVR earlier this month. Made possible by the generosity of a number of Fund members, who wish to remain anonymous, this purchase represents a huge leap forward for the Fund, as this material is by far the single most expensive item in the construction of the boiler and firebox. 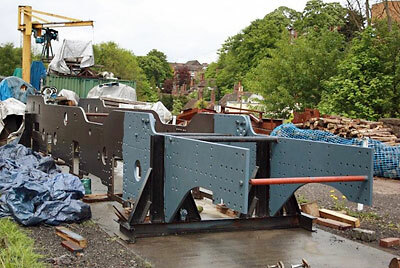 We are now looking seriously at the possibility of having the rear (tapered) section of the boiler built, as well as acquiring the steel for the outer firebox. With an approximate figure of £17,000 for the boiler rear section, we would be very pleased to hear from anyone prepared to help with financing this further step in the engine's construction, which would bring us well on the way to completing the biggest part of the job! We have started leveling and alignment of the two frame plates, which will continue, weather permitting, in order to achieve the correct dimension from outer face of one plate to outer face of the other. We can then measure the dimension between the inner faces for the purpose of machining the stretchers to the correct size. 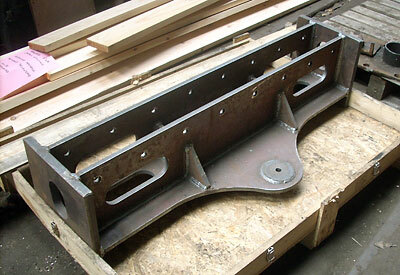 Tony has finished machining the final flat face of the buffer beam brackets. The next job will be to drill them to correspond with the frames and buffer planks. 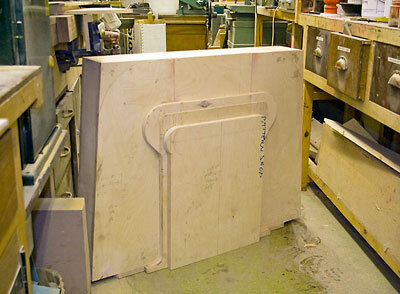 Meanwhile Phil Harvey continues with the fabricated drag box assemblies that is hidden behind the buffer beams. Very subtle differences between the front are rear assemblies make for complex drawings. Painting of the frames has started, courtesy of Colin Williams. The frame stretcher/steam brake cylinder support, fabricated by Dave Hewson (of driver's pedestal fame). The ends will require some machining to achieve the correct overall measurement to fit precisely between the frames followed by drilling. 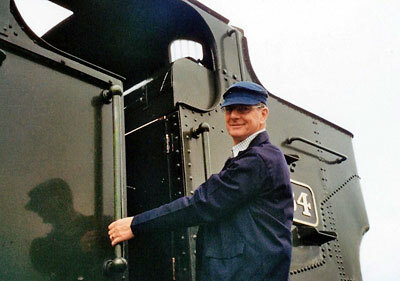 The footplate prize winner John Shaw on Wednesday 6th May. We had hoped for 42968 and had her on Tuesday but a fault occurred so we had the large (but rather cosier) Prairie 5164. In the pattern shop Brian is working on the massive horn block pattern for the centre drivers - about the size of a domestic fireplace and almost as complex as Rubik’s Cube!